By the time this post goes up onto the interwebs I will be winging my way to the South American paradise of Ecuador, which is loaded with lifers. Some might see my nine-day excursion as irresponsible considering that I am currently unemployed, have a ten-month-old baby, and a blog that has recently added about twenty new beat writers. Personally, I don’t care what this hypothetical “some” thinks, but, in my defense against my imaginary detractors, I will say that I am going to redouble my efforts to find gainful employment upon my return, Desi is safely in the capable and loving hands of his grandmother and mother, and the blog and beat writers are going to be well taken care of in case of technical difficulties by Mike and Charlie. Besides, Ecuador! You know, in South America! Where there are the Andes, rain forests, antpittas, a horde of hummingbirds, and tons of tanagers! It would be irresponsible of me not to go. Those who read 10,000 Birds will likely be less than surprised to learn that I and my six traveling companions, all Queens birders, will be hosted at the Pululahua Hostal, which is owned by one of our new beat writers, Renato. You might remember Mike making a visit to Pululahua back in January and raving about the birds and the wonderful time he had. Well, I think that I will have just as good a time and, considering that I am spending twice as long in Ecuador as Mike did, I will likely see significantly more species! This is a very good thing because my life list is currently mired at 785 species. If things go according to plan I should see my 1,000th lifer while I bird Ecuador! Sweet! But, really, the birds in Ecuador, while numerous, are more than just plentiful. There are some seriously sought-after species as well. Where else can one see Giant Antpittas, Torrent Ducks, Sword-billed Hummingbirds, Andean Condors, Oilbirds, Toucan Barbets, and many other primo species? I just hope I survive the inevitable head-exploding (like I have on my last couple of outside-the-states trips). Wish me luck on my journey and look for some (hopefully) amazing images and blog posts upon my return! Hello! I’m visiting this blog for the first time, really interesting stuff! Will be cool to follow you all, wish you a great trip to Ecuador. ¡Qué suerte! Espero que encuentras muchas mil aves. Buen viaje. I’m not insanely jealous. I’m also not bothered that ill health cost me my trip to Brazil this year or that Prop 19 failed in California. Well, good luck then, right? WOW !!!!!!!! Have a fabulous time ! Will be looking forward to the pictures. Sorry I couldn’t help you out this morning Corey, but was at an undisclosed location, getting a life & state bird and one you don’t have in NY yet. I see you’ve once again forgotten your optics and field guide. 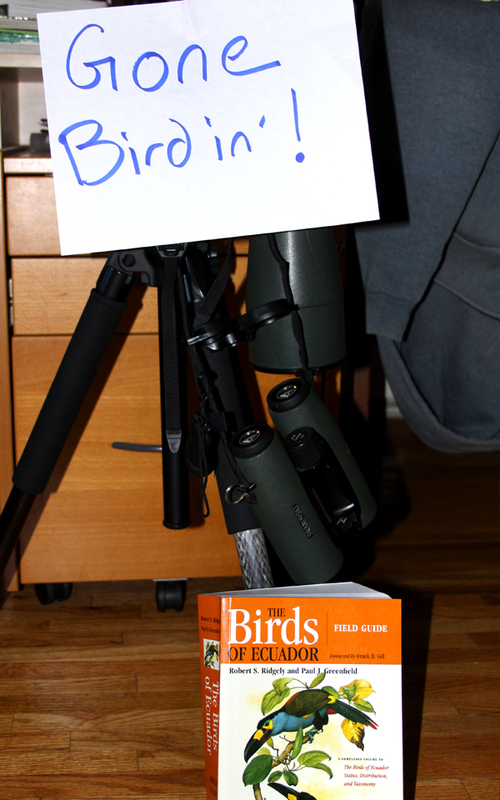 Are you trying to promote some kind of minimalist style of birding? Have a Great trip! Happy Birding! I’ve been to Ecuador but I’ve never been to the Pululahua Hostel. I heard it’s a gem though! Good luck, we expect to hear what you see! Have a great trip Corey!! We want to see fabulous pictures! damn. some jealously happening this side of the ocean. have an awesome time! Awesome to hear that you are on your way to Ecuador! That bird crazy country is kind of like the promised land for birders. Even though I live in Costa Rica and have spent quite a bit of time there, I stil REALLY wish I could head down there once a year. Try to keep the head exploding to a minimum and please post some cool pics. He he.. Latest update from Ecuador. Corey finally arrived and yes he forgot the bird guide and the optics, he was also kind of lost at the airport from lack of traveling experience and took him more than 2 hours to get out of customs. I heard they probed him but he did not admit. I can understand it, I would be pretty upset too. Any way things are not going so well, we birded in Pululahua and Yanacocha and he missed most of the birds, I guess he was still sore (mentally) from customs. He.. he.. Tomorrow we are going to visit Maquipucuna and I sure hope he overcomes all his shortcomings. I am surely enjoying this since he does not have access to internet and I can say whatever I want!!! Thanks for the update Renato! You know, I had some suspicions when Corey asked about being a Beat Writer. I’m starting to get it now. Get a couple dozen other bloggers to write posts for you, then start traveling the world, beefing up your life list and working toward retirement! What a plan! Have a great time Corey and we’d better see some photos when you return! Have a wonderful and very, very birdy trip. I visited Ecuador for the first time in June of this year, and the hummingbirds alone are well worth the trip. The Torrent Duck is a fabulous bird, too!